When you think of Texas, one image that may come to mind is oil wells. 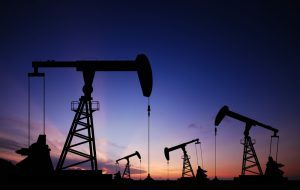 Texas is the highest-producing state for both oil and gas. In 2013, Texas had around 10.5 billion barrels of oil in reserves, and produced another 1.2 billion barrels in 2014. This is a third of all crude oil produced in the US that year. North Dakota comes in second, but with less than half as much oil, showing 5.7 billion in reserves, and 396 million barrels produced. Other top oil and gas producing states include Alaska, California, New Mexico, Oklahoma, Colorado, Wyoming, Utah and Louisiana. The Railroad Commission of Texas has two main goals: protect the environment and preserve individual property rights. The Commission’s Oil and Gas Division regulates oil and gas wells in Texas. The Commission requires drillers to provide a form of financial security before issuing a permit to drill, recomplete or reenter a well. The security can be a surety bond, letter of credit, or cash deposit. A surety bond continues until the conditions of the bond have been met, or is released by the Commission or its authorized delegate. Individual Bond: Form P-5PB(1) is only for well operators that have no other activity other than wells. The bond covers all permitted wells and all current wells. The amount of the bond is determined by the depth of the wells. Operators without wells that are required to file financial assurance must have a $25,000 bond. Bay and offshore wells are required to have additional security. A presumed plugging cost for a bay well is $60,000 and offshore well is $100,000. Commercial facilities for storage, reclamation, treatment, disposal or recycling will use bond form CF01. No matter if you have one well or thousands, SuretyGroup.com can get you bonded. We are licensed to write all bonds for the Railroad Commission of Texas and can deliver your bond quickly. Call our Surety Bond Specialists at 844-432-6637, email info@suretygroup.com, or apply online at suretygroup.com.